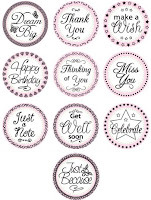 Have you seen the new JustRite Stampers November Releases? JustRite has done it again, it's Hip to be Square with the new 2" Square with coordinating Decorative Frame Borders. 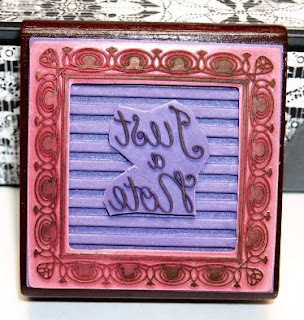 Don't have Monograms to accessorize, no problem, there's also a Deluxe Square Monogram Kit! Today, I'm sharing a project made with the new 2" Wood Stamper, Decorative Frames Borders - Square and the new Just a Note Centers & Borders. To create the border/sentiment, I placed my Decorative Frames Border on the 2" Wood Stamper, added my sentiment from Just a Note Centers & Borders (note - don't be afraid to trim your centers, you'll get more mileage out of them, here I trimmed the round center and placed it on the Square stamper), then stamped in Black on White card stock, cleaned my stamp, then stamped in Riding Hood Red on White card stock. 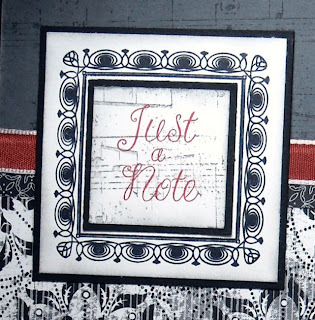 I punched the sentiment from the center of the Red stamped image using a 1" square punch, stamped the Aged Sheet Music from Cornish Heritage Farms in Going Grey, sponged the edges in Grey, then layered it on a 1-1/4" Black square, I finished by layering it onto my stamped border which was sponged in Grey, then onto the Black Panel. To complete my card I stamped the Aged Sheet Music in Grey on Grey card stock, layered onto a Black panel then adhered to a White card stock base. I adhered some Night & Day Speciality paper from Stampin' Up to my panel and a piece of Riding Hood Red Organdy Ribbon, then attached the sentiment/frame panel. I created the beautiful coordinating One Card Organizer using Grey and Black card stock, accessorizing with the Night & Day Specialty Paper. 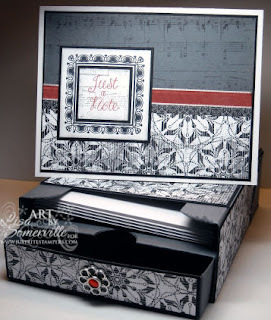 You can find the template for this wonderful organizer on Adela's Blog. Thanks for stopping by, be sure to check out the JustRite Blog each day this week as they reveal the new releases and offer Blog Candy. Lisa, this looks great! Very elegant! Would love for you to do a 3D challenge on PCP. Oh wow! What a beautiful project!!! Love it! Just Right for the gift giving season, beautiful project, luvin' everything about it. What an elegant project. Thanks for sharing.